Indian boxer MC Mary Kom has given her country more than just a sporting spectacle with her bronze medal win at the London Olympics. It may not have been apparent to the 29-year-old boxer, but her teary-eyed apology for not bringing home the gold has pulled the relatively isolated north-east Indian states much closer to the rest of the country. The Indian media and citizens on social networking websites have reflected this sentiment and felt that Kom's achievement is a step towards reconciliation. The mother-of-two hails from the remote state of Manipur in the country's politically fragile north-eastern region, and her triumph is likely to integrate the country's seven easterly states in the true sense. Insurgency and violence have marked life in the north-eastern region for many years and the states have been unable to share the fruits of India's economic growth. Kom herself has risen from supporting her farming-dependent family in the fields in Manipur, struggling without a proper kit and travelling long distances by bus or train. Much of the isolation of the states, collectively called The Seven Sisters of India, can be attributed to violence and a conspicuous presence of Indian troops in the region. The constant struggle between separatist groups and government troops has adversely affected tourism and business sentiments in the region. Many youths find it safer to leave their hometowns and head to the metro cities of Delhi, Mumbai and Bangalore in search of better jobs and education. But their exodus to bigger cities only marks the start of their struggle. "People from the north-east, especially students, face a lot of difficulties adjusting in big cities like Bangalore as they overcome barriers of language, features and creed," The Times of India (TOI) wrote. There's some racial discrimination against these communities. A large number do manage to find good jobs and better education, but this sometimes comes at the cost of racial abuse. Several cases of racial violence against north-eastern youths have been reported in Delhi, Mumbai and Bangalore in the recent past. It is believed that most were targeted due to their distinctive appearance and different culture. The Indian Home Ministry recently asked state governments to take stern action against those who racially abuse students from the north eastern states. In addition, several telephone help-lines have also been set up to help the students from the north-east. Healing touch As the world welcomed women's boxing to its debut Olympics, Kom became one of India's top medal contenders and she hasn't disappointed her supporters. Many media commentators believe that Kom's triumph will increase awareness about the north-east and its distinctive culture. The Indian media, which mostly concentrates on cricket, has given wide coverage to her achievement. 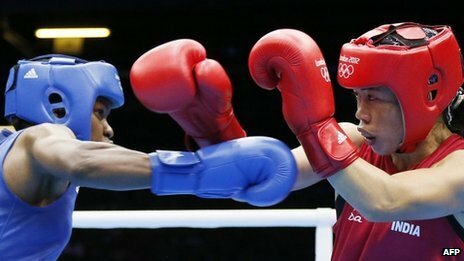 While newspapers gave her front-page spots, news channels ran wall-to-wall coverage during her bout against British boxer Nicola Adams. The TOI said Mary Kom not only fought her way to assure the country its highest Olympic tally ever but also highlighted her state (Manipur) and its neglect over the years. The Hindustan Times lashed out at previous governments and wrote that Hindi-speaking politicians have not been able to do justice to the north-east. The paper urged the current federal government to use Mary Kom's triumph to "integrate back states like Manipur to mainstream Indian society". Columnist Venky Vembu also praised "magnificent Mary" in his column on Indian website Firstpost. "Mary Kom's smile in the face of defeat, on the other hand, united our country - and, for a few fleeting moments, made us feel good about ourselves," he wrote. "Not everybody in the country can tell the different north-eastern states and their people from each other. These boxers' achievements will create awareness and help in the progress of our poor state," Vivekananda Rajkumar, a 32-year-old Manipuri professional told the Times of India. "I expect racial discrimination to reduce as our people win medals for the country," Longjam Tony Singh, an MBA graduate, told the TOI. Praise on Twitter Many Indians including Bollywood actors and cricketers are showering praises on Kom. "My great honour and privilege to have spoken to Mary Kom earlier today on the phone. What a lady!! You have made all of India proud," Bollywood star Amitabh Bachchan tweeted on last night. "Mary Kom is an amazing woman. What an effort to win a medal for India. We all are extremely proud of you," cricketer Sachin Tendulkar tweeted. Prominent journalist Barkha Dutt tweeted: "Mary Kom you shouldn't be sorry. It is us who should be sorry for not giving you the love & facilities that was your due long ago." Some other Twitter users took the opportunity to highlight the problems people from the north-east face. A user named "Anthony" posted a map on Twitter and asked people locate Manipur - and unsurprisingly many of them got it wrong. Another user named "Oculus" tweeted: "Mary Kom apologizes for not winning gold. A billion Indians yet to apologize for not knowing where Manipur is."